Looking for High Security Cheques with a Hologram Gold Foil? Why use a Hologram Gold Foil? 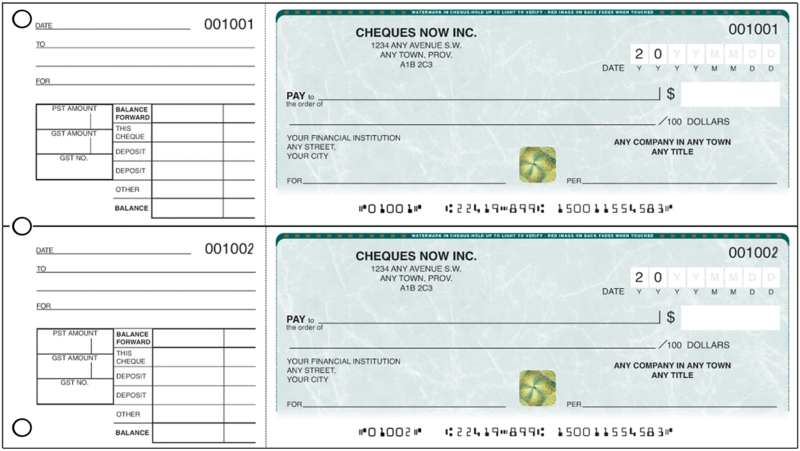 - The ultimate in cheque security a multi-coloured reflective image fused to each cheque. - Appears as non-shiny if scanned or photocopied. - Gold foil hologram protects against counterfeiting! - Cant be duplicated by color copies. - The banks standard supplier carries it on all of their business cheque products. The reason your financial institution tell you to buy from them is because the banks are in a contract and receive commissions on all the cheque orders. We price match between Canada’s two largest Cheque suppliers, The National Bank Cheque Supplier & Cheques ASAP. We ensure that we will save you money by matching the lowest cheque prices of these suppliers. Then we offer all our clients on every single order they place 25% more laser cheques and 50% more manual cheques. In addition to the savings you receive by getting 25 or 50% more cheques, we also increase your cheques security features at no extra cost to you. We are currently the only cheque supplier in Canada that offers a higher line of security features than the banks cheque supplier. 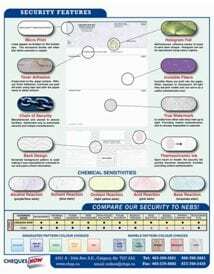 We have all the same security features as The National Bank including all 5 chemical sensitivities, a hologram gold foil, real watermark, invisible fibers etc.. The extra security feature we add is a special heat sensitive ink called Thermochromic Ink. We print a pink thumbprint on the back of our cheque stock in this ink. It verifies your cheque is authentic and much like the hologram gold foil it is also not duplicatiable on a photocopier.